This film looks at the highlights in NASA's history from its creation in the 1950s, through the glory days of the Mercury, Gemini and Apollo programs, birth of the space shuttle and the loss of Challenger, launch of Hubble and much more. If at first you don't succeed, keep on trying. That is what the astronauts of space shuttle Endeavour's maiden voyage did in their difficult job of rescuing a wayward communications satellite. Spacewalkers were unable to retrieve the Intelsat 603 spacecraft, which had been stranded in a useless orbit, during multiple attempts using a special capture bar. So the crew changed course and staged the first-ever three-man spacewalk to grab the satellite by hand. The STS-49 astronauts describe the mission and narrate highlights in this post-flight presentation. The mission for the crew of space shuttle Challenger's April 1984 flight was two-fold -- deploy the experiment-laden Long Duration Exposure Facility (LDEF) and then track down the crippled Solar Max spacecraft, capture it and perform repairs during spacewalks. Initial attempts by the astronauts to grab the craft while wearing the Manned Maneuvering Unit spacewalk backpacks failed, but the crew ultimately retrieved Solar Max and installed fresh equipment while it was anchored in the payload bay. The crew narrates this post-flight presentation of home movies and highlights from mission STS-41C. The space shuttle program was grounded for 32 months in the painful wake of the 1986 Challenger accident. Americans finally returned to space in September 1988 when shuttle Discovery safely launched for its mission to deploy a NASA communications satellite. Enjoy this post-flight presentation narrated by the astronauts as they show movies and tell the story of the STS-26 mission. Imagine a space shuttle mission in which the astronaut crew launched two commercial and one military communications spacecraft, then conducted a pair of incredible spacewalks to recover, fix and redeploy a satellite that malfunctioned just four months earlier. The rescue mission was a success, starting with an astronaut making a catch of the spinning satellite with just his gloved-hand. Enjoy this post-flight presentation narrated by the astronauts as they tell the story of shuttle Discovery's August 1985 mission known as STS-51I. In our continuing look back at the classic days of the space shuttle program, today we show the STS-41D post-flight presentation by the mission's astronauts. The crew narrates this film of home movies and mission highlights from space shuttle Discovery's maiden voyage in August 1984. STS-41D deployed a remarkable three communications satellites -- a new record high -- from Discovery's payload bay, extended and tested a 100-foot solar array wing and even knocked free an icicle from the shuttle's side using the robot arm. As the title aptly describes, this movie straps you aboard the flight deck for the thunderous liftoff, the re-entry and safe landing of a space shuttle mission. The movie features the rarely heard intercom communications between the crewmembers, including pilot Jim Halsell assisting commander Bob Cabana during the landing. On Christmas Eve in 1968, a live television broadcast from Apollo 8 offered this message of hope to the people of Earth. The famous transmission occurred as the astronauts orbited the Moon. New findings from a large survey of galaxies suggest that star formation is largely driven by the supply of raw materials, rather than by galactic mergers that trigger sudden bursts of star formation. Stars form when clouds of gas and dust collapse under the force of gravity, and the study supports a scenario in which exhaustion of a galaxy's gas supply leads to a gradual decline in the star-formation rate. The results, presented this week at the American Astronomical Society (AAS) meeting in Washington, D.C., come from the Extended Groth Strip Survey, a collaborative effort using major ground-based and space-based telescopes to focus on one patch of sky that offers a clear view of the distant universe. By analyzing data from a combination of powerful instruments, researchers derived information on galaxy weights and star formation rates, as well as the numbers of stars already formed, for more than 3,500 galaxies. They found that the weight (or mass) of a galaxy is an important factor determining how fast it makes stars and how the star formation rate evolves over time, said Kai Noeske, a postdoctoral researcher at the University of California, Santa Cruz. 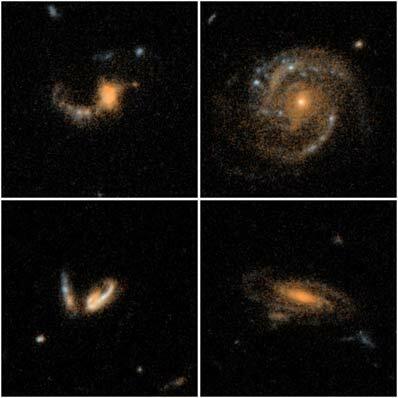 "The picture we're getting is that heavy galaxies form stars early and rapidly, whereas smaller galaxies form their stars over longer timescales," said Noeske, who presented the group's findings at the AAS meeting. The study's findings shed light on ongoing debates over the physical mechanisms that activate star formation in galaxies--in particular, the importance of starbursts triggered by mergers of similar galaxies. "What we see is consistent with mostly undisturbed galaxies using up their gas over time, like firewood burning down," Noeske said. The Extended Groth Strip collaboration consists of astronomers from 16 institutions who have pooled their data and resources to create what is now one of the most intensely studied regions of the sky, said David Koo, professor of astronomy and astrophysics at UCSC and a member of the team. Light from distant galaxies takes billions of years to reach Earth, giving astronomers a window into the past. The galaxies included in this study cover a wide range of redshifts (a measure of distance) and corresponding "lookback times," extending out to redshift 1.4 or as far back in time as 9 billion years, about two-thirds of the age of the universe. The study also encompassed galaxies with a wide range of masses. "We have now been able to track star formation in galaxies out to modest distances, more than half the age of the universe, and we find that all galaxies, big or small, seem to be fading gradually so that they are less active today than they were further back in time," Koo said. Astronomers have found from previous galaxy surveys that star formation activity becomes more intense as they probe farther back in time. One proposed explanation has been that galaxy mergers were more frequent in the past, triggering bursts of star formation due to compression of gas clouds during the merger process. "We are finding that mergers do not appear to play the dominant role in star formation, because we see normal-looking, undisturbed galaxies that are undergoing large amounts of star formation," Koo said. "There probably are multiple mechanisms that can activate star formation. We are asking which is dominant," he added. "Mergers do drive star formation; they just don't seem to be the major driver." Koo and Noeske are both members of the DEEP2 team, one of seven survey teams involved in the Extended Groth Strip Survey. DEEP (Deep Extragalactic Evolutionary Probe) began about 15 years ago, led by Koo and other UCSC astronomers using the twin 10-meter Keck Telescopes at the W. M. Keck Observatory in Hawaii and NASA's Hubble Space Telescope to conduct a large-scale survey of distant field galaxies. Phase 2 of the project, led by UCSC and UC Berkeley, began three years ago using the powerful DEIMOS spectrograph on the Keck II Telescope and has now gathered spectroscopic data from almost 40,000 distant galaxies. DEEP2 has observed 13,000 galaxies in the Extended Groth Strip, one of four fields surveyed by the project. Joining the DEEP2 team in the Extended Groth Strip Survey is a broad consortium of other survey teams that are contributing data. Infrared data from NASA's Spitzer Space Telescope were especially important for Noeske's study, because they enable astronomers to see through the dust that obscures much of the star formation taking place in distant galaxies. "Having the infrared data from Spitzer allows us to measure the star formation rates very accurately because we are no longer blinded by dust," Koo said. The array of instruments trained on the Extended Groth Strip covers a tremendous range of wavelengths, including x-rays and radio waves, as well as infrared, visible, and ultraviolet light. "This is an exceptional period of time for astronomy, because for the first time we are able to combine data from almost all of the important wavelengths," Koo said. This work is linked to other projects that analyze Extended Groth Strip data. The same session at the AAS meeting includes a presentation by Kevin Bundy of the California Institute of Technology on how the termination of star formation is related to a galaxy's weight and environment. Projects led by Jennifer Lotz of the National Optical Astronomy Observatory (NOAO) and Lihwai Lin of National Taiwan University measure the frequency of galaxy mergers and their importance in the production of new stars over the past 8 billion years. DEEP2 team: Marc Davis (principal investigator), Jeffrey Newman, and Michael Cooper at UC Berkeley; Sandra Faber (co-PI), Kai Noeske (lead author), David Koo, and Susan Kassin at UCSC; Benjamin Weiner at the University of Maryland; Christopher Willmer and Alison Coil at the University of Arizona; and Jennifer Lotz at NOAO. Spitzer IRAC team (Infrared Array Camera on the Spitzer Space Telescope): Giovanni Fazio (PI), Jiasheng Huang, and Pauline Barmby at the Harvard-Smithsonian Center for Astrophysics, and Gillian Wilson at the Spitzer Science Center, Caltech. Spitzer MIPS team (Multiband Imaging Photometer for Spitzer): George Rieke (PI), Emeric Le Floc'h, and Casey Papovich at the University of Arizona. Palomar Near Infrared Survey: Richard Ellis (PI) and Kevin Bundy at Caltech, and Christopher Conselice (co-PI) at the University of Nottingham, UK. GALEX team (Galaxy Evolution Explorer satellite): Christopher Martin (PI) and Todd Small at Caltech, and David Schiminovich at Columbia University. The EGS collaboration also includes radio astronomers observing this region with the NRAO Very Large Array and the James Clerk Maxwell Telescope. Institutions involved in the collaboration include, in addition to those listed above, Imperial College of London, Space Telescope Science Institute, Herzberg Institute of Astrophysics in Canada, National Taiwan University, UCLA, Oxford University, and the Royal Observatory of Edinburgh. This work was supported by the National Science Foundation, NASA, and the Space Telescope Science Institute.